For parish communities: to recognise the immensely important work that happens in our schools, to the credit of teachers, staff, senior leadership teams, Principals, Boards and the wider community. Also accompanying the videos is a PowerPoint presentation that schools can use in the staff room, with the videos embedded and discussion questions for staff. Once teachers have discussed the videos, we believe it would be helpful to show to students in class with time for discussion or in assemblies. (Research indicates that many students make decisions about their careers as early as years 7 and 8.) 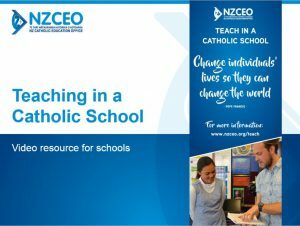 We believe both primary and secondary students would enjoy discussing the possibility of teaching in a Catholic school. Staff may pick and choose which video/s they show. We would love to see schools engaging with the videos e.g. watching the video as a group during staff meetings, discussing the material, agreeing on action items to make changes in their school (if applicable). Parish communities may also enjoy seeing and learning about our schools and we encourage everyone to share the videos. A PowerPoint presentation with the recruitment videos embedded; to help engage staff in discussion about their profession and experience working in a Catholic school.